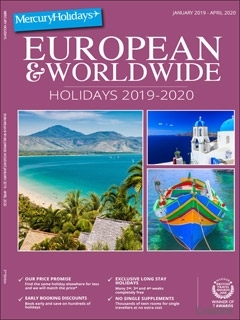 To order a printed copy of the Mercury Holidays - European & Worldwide brochure, simply click the Request button below. Mercury Holidays is the best place to find great value holidays to a range of destinations worldwide. Whichever holiday destination you're thinking of going to, Mercury Holidays offers great deals on holidays, with a wide range of options at some of the world's finest holiday locations. When you're looking for a supremely relaxing break, an all inclusive holiday could be just what you need. Take the stress out of planning your holiday by choosing an all inclusive holiday that will ensure that all of your needs are taken care of. If you're travelling alone or with a friend, and would like the privacy of your own room, you don't want to find yourself paying extra charges. That's why they look out for their single travellers – and why their solo holidays offer a range of hotel stays and excellent value package deals that offer no single supplements for single traveller holidays. Mercury Holidays offer a huge range of all inclusive holidays in resorts around the world, so you're sure to find the perfect trip whatever your tastes. Mercury Holidays - European & Worldwide Brochure Eddy B. said: Splendid descriptions of holidays with clear pricings. Mercury Holidays - European & Worldwide Brochure Gordon D. said: Many trips with no single room supplement is excellent! By pressing the Request Printed Brochure button you give consent to Mercury Holidays - European & Worldwide (and their Data Processors for the specific purpose of delivering your literature) to send you their Brochure .